Are you a meatloaf fan? 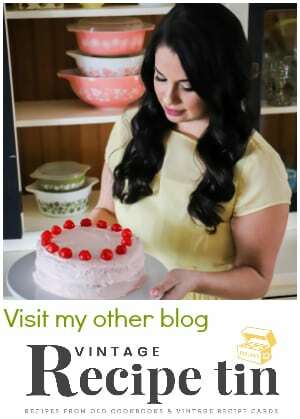 I’m guessing you are if you clicked a link to get here! 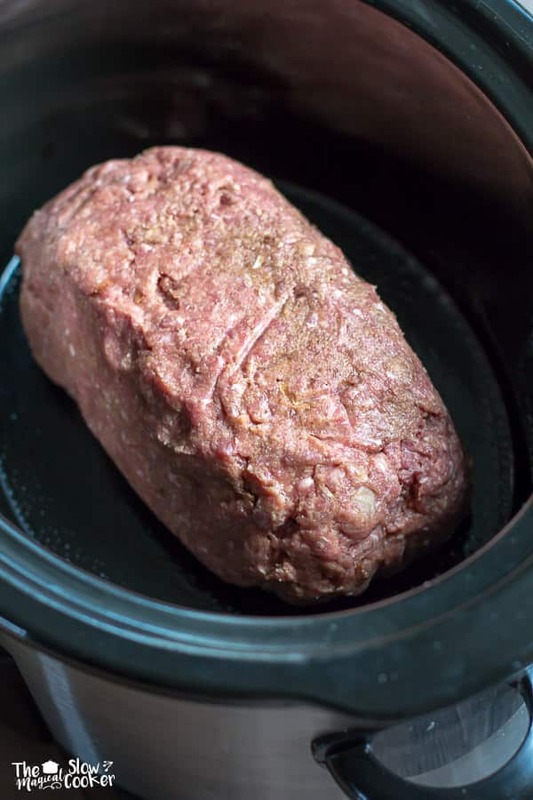 This Slow Cooker Onion Soup Mix Meat Loaf is a new recipe for me. I have always used my mom’s recipe for meat loaf. I wanted to try this onion soup mix meat loaf out for a freezer meal, it sounded easy to throw together. While this meat loaf cooks it has a heavenly beefy onion scent to it, which comes from the onion soup mix. Unlike my mom’s recipe which smells to me like bell peppers while it cooks (both good smells!). In a medium-sized bowl mix together the eggs, milk, ketchup, breadcrumbs and dry soup mix packet with a spoon. Using clean hands add the beef and combine the wet egg mixture with the beef until just combined, don't over mix it. Shape into a loaf shape in an oval slow cooker. Take a spoon and ladle out and discard the fat that is surrounding the meat loaf. 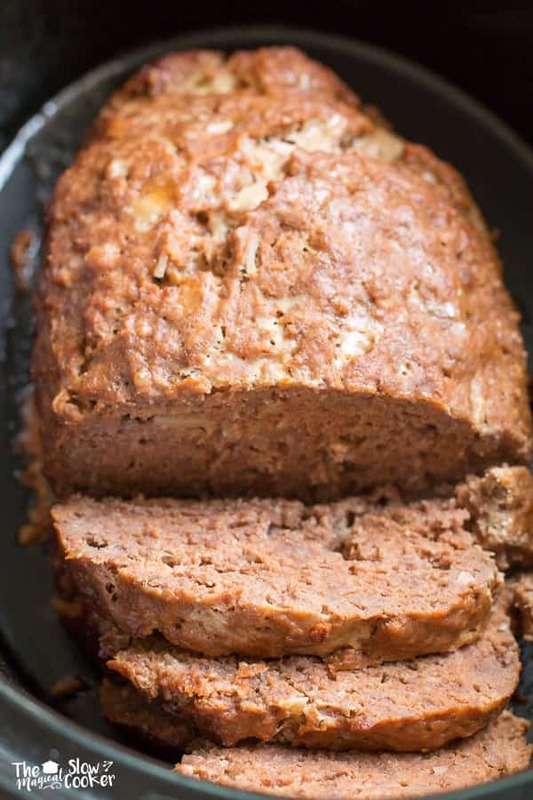 Cut the meatloaf into slices being careful not to scratch the slow cooker with the knife. Write the date and cooking instructions on a zip lock bag. Mix loaf as directed above. 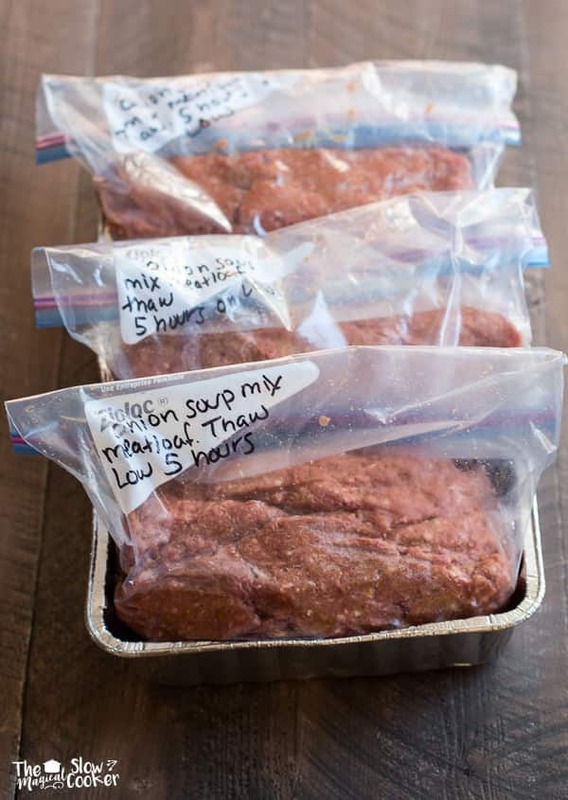 Place the meat loaf mixture into a zip lock bag that has been set into a reusable foil pan. The pan is just to keep the meat in to a loaf shape while freezing. Squeeze all the air out of the bag. Place the meat loaf in the freezer (leave it in the tin). Freeze for up to a month. To cook after being frozen. 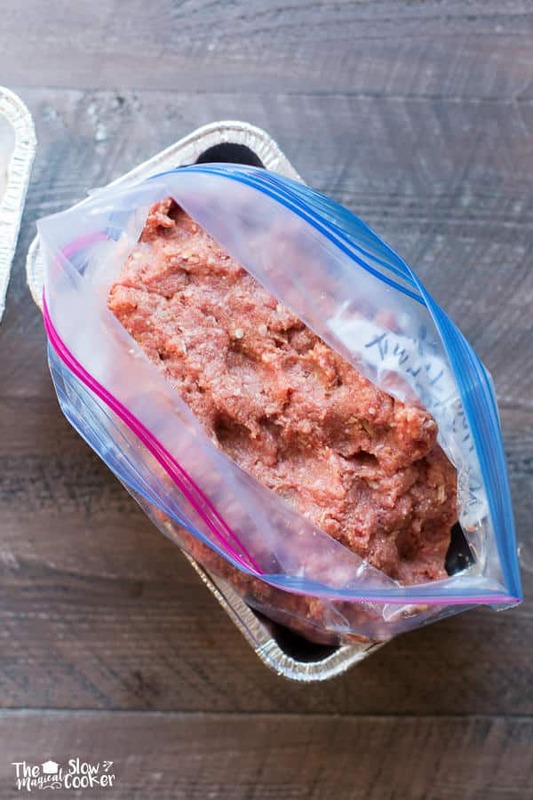 Place the frozen meat loaf (still in the tin) in the refrigerator to thaw. About 36 hours is the perfect amount of time to thaw. Flip the meat loaf into the slow cooker, if you are careful it should stay in the correct shape. Cook as directed above. Below I added the meat into a ziplock bag while it is resting in an aluminum loaf pan. This helps keep the loaf shape while it freezes. And I can reuse these loaf pans next time I make these meat loafs. Label them with the date and cooking instructions. 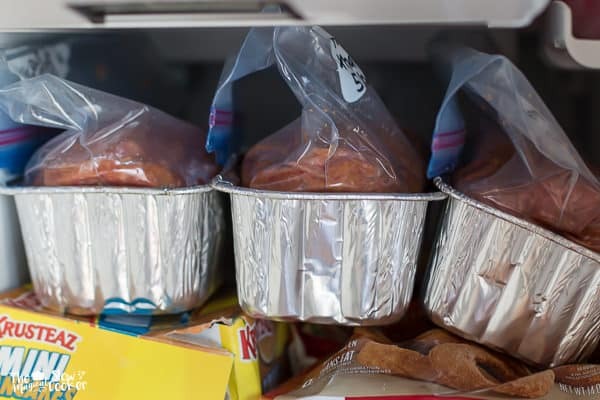 I freeze these meat loafs for up to a month. 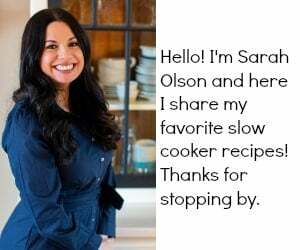 I thaw one in the fridge for about 36 hours, then I flip it over into the slow cooker, I can actually do this without touching the meat! Such an dinner once you get these prepped for the month. I hope you enjoyed this second edition of Freezer Meal of the Month. I sure am having fun making these handy meals! 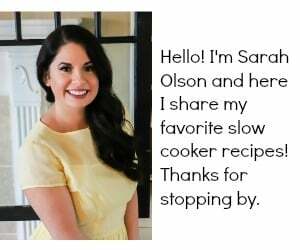 See you next week with another delicious slow cooker recipe! Can I use ground Turkey instead of beef in this recipe? I think it would turn out good! I’ve done ground turkey in stuffed peppers before in the crock pot and it turned out great. I’ve never tried meatloaf in the crock pot but I’m going to give it a try. I suggest adding some onions and minced garlic in with the meat. Thanks for the great recipe. I love meatloaf but I’ve never tried one with onion soup and I have certainly never tried one in the slow cooker! Sounds yummy! My concern would be the meatloaf sitting in all the grease while cooking for that amount of time. I’m going to put the meatloaf in a foil pan, with holes in the bottom and place it on a trivet in the crockpot. YOU CAN GET A METAL TRIVET ONLINE TO FIT YOUR SPECIFIC CROCK POT TO KEEP IT OUT OF THE RENDERED JUICES. I’ve always used a recipe similar to this, with the onion soup mix, but i’ve never cooked it in the slow cooker! Will try it soon! Just a tip when cooking meatloaf in the slow cooker.. I always crumble foil balls and place in bottom of slow cooker then I place the meatloaf on a sheet of foil that has been punctured with a fork in several places to let the grease drain away from the meatloaf. I always have great tasting meatloaf this way. Could you use a ranch packet instead of onion soup mix? I don’t see why not! It probably would give great flavor! I’ll try it. I made it once with the onion soup mix and it was delicious. Thanks for the great recipes! 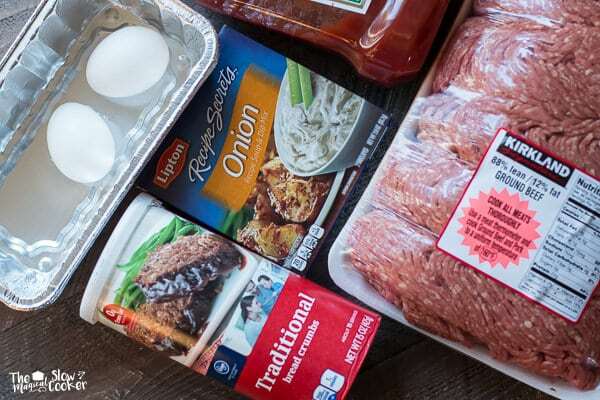 Yes, find a meatloaf recipe online that is for 2 lbs. and cook this according to the oven directions.S work fine. even better with Lipton beef onion mix! I tried this. Tasted fine but preferred the baked. The texture was more like a processed meat. Can I cook this on high in crock pot for 3 or more hrs? Hi Mona! I don’t know if that would be enough time for the center to heat up. I have not tried. 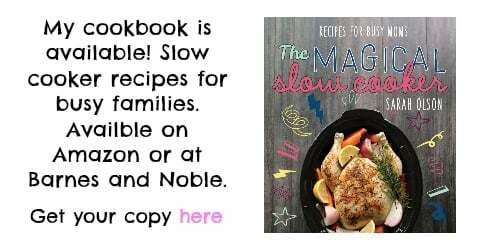 The slow cooker heats up very slow.